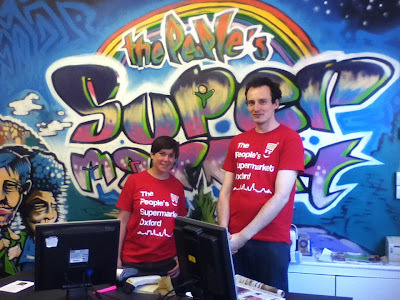 The People's Supermarket has recently opened on Oxford's Cowley Road. 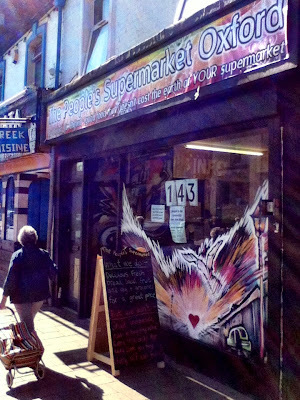 The shop is a community-created alternative to the big supermarkets, providing nutritious food at lower prices, with profits going back into the local community. I talked to Chris in the shop who has run a mobile supermarket from the back of a converted bus for several years. The new venture has needed substantially more investment to set up, but offers the advantage of a fixed community space where people can come together and get involved. To become a member of the supermarket, locals (currently, 143 of them) pay a £12 membership fee to purchase a "share" of the supermarket, and commit to volunteer four hours of their time every four weeks, to run the supermarket. The "share" owners get a say in how the supermarket is run - what products are sold, how they are sourced, how any surpluses generated are spent. "Share" owners also get a discount on their shopping. Integral to the supermarket is The People's Kitchen, where close-to-date food that would end up in the bins at a normal supermarket is cooked into ready meals, drinks and cakes for sale in the supermarket. We wish The People's Supermarket every success and wonder if something like this could work in Sneinton? To find out more, and check out their price comparisons, head over to The People's Supermarket Oxford's website. Here's a video that The People's Supermarket Oxford made about their project, as part of funding bid for kitchen equipment. You can vote for them to get the funding here.